I decided to make my own boutonnieres for our wedding. I had only made one boutonniere before, for my senior prom. These turned out great and were only a fraction of the price of getting them done by a florist! I went to Hobby Lobby and raided the dried florals section! They usually have great 1/2 off sales at least once a month. You can also use your own dried florals and sticks from your backyard but since I don't really like getting dirty, I just bought some. I got the ribbon at 1/2 off at Michaels. Start by plugging in the hot glue gun. 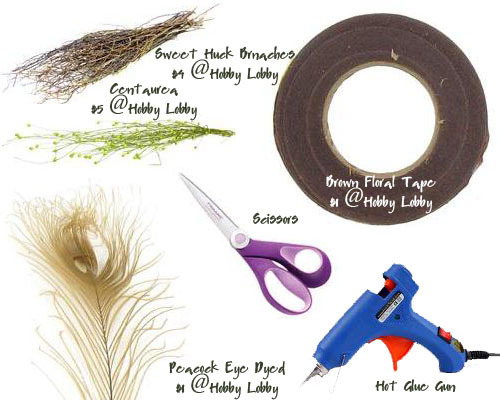 Sort through your dried plants and cut the ends off into small pieces. Arrange them the way you want (I stacked mine) and then glue them with a tiny dot of hot glue. Take the floral tape and cut off a piece a few inches long and neatly wrap it around the bottom portion. This will cover any hot glue marks. You can use a little glue or water to keep the ends in place. Be careful... the tape can get pretty sticky! Tie with a cute ribbon that matches your color scheme. That's it! It is that easy! I made 11 and it took me only an hour (or one episode of Bones).